The perfect finishing touch to your vintage themed wedding, this Two Hearts Vintage Inspired Copper Bottle Stopper will be appreciated by your guests. Each favor has a copper color metal double heart design attached to a copper metal base. Each time your friends and family sit down to a bottle of their favorite vintage, they'll recall fond memories of your event. We package each bottle stopper in a rustic burlap drawstring gift bag complete with a thank you tag. The packaging shown in the photography is how the product comes? Can you personalized the heart wine stopper and how much you charge each? 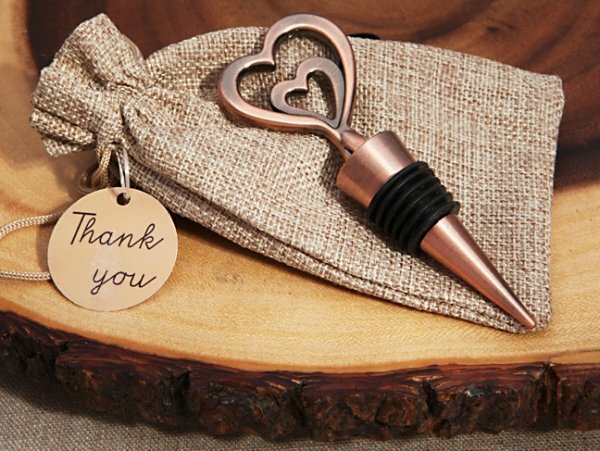 Each Two Hearts Vintage Inspired Copper Bottle Stopper will be packaged in a rustic burlap drawstring gift bag complete with a thank you tag as shown in the picture and this one does not offer any personalization unfortunately. I am interested in the Two hearts Vintage inspired copper bottle stopper. Can I get a sample before purchasing the quantity I need for my party? Yes, a sample is available. You can order it by entering quantity 1 and your zip code on the bottle stopper product page to add it to your cart and checkout. Can the tag be personlized? In order to deliver your products as fast as possible and keep our prices low, we ship our products directly from the manufacturer. The Two Hearts Vintage Inspired Copper Bottle Stopper is shipping from New Jersey. Where do you get the little bags to go with the bottle stopper? The burlap bags are included with the Two Hearts Vintage Inspired Copper Bottle Stoppers. Each bottle stopper will also be packaged in a rustic burlap drawstring gift bag, complete with a thank you tag. Can I get the burlap bag screen printed? Here's one of our burlap screenprinted bags, click here. There are a few different options found on this page. Can I also have the burlap bag screen printed with a logo? I'm sorry, we cannot print logos on the burlap bag of this Two Hearts Vintage Inspired Copper Bottle Stopper; we can only print the designs provided on our site per our templates.